Nobody likes having your phone battery dying on you and leaving you stranded somewhere, be it while you’re hiking on top of a mountain, while you’re relaxing at the beach, or even at a family event and forcing you to actually interact with your family. Which is why the selection of portable power banks has drastically increased in the last couple years. With all the choice available on the market, how do you select the best one? In this post I review the new OUTXE Solar Charger, to see if it really is the best solar charger for backpacking and the best solar power bank of 2018. 1.2 How long does it take to charge? 3 How does it compare? Before selecting a power bank there are some criteria it needs to meet for me to be happy with my purchase. The following are all things I keep into account when choosing a power bank. The most important factor for me is charging capacity. Before I add something to my backpack I want to know exactly how much extra battery life it’s going to give me. After charging capacity, this is the second most important criteria for me. I want to know how many times I’ll be able to charge my phone, GoPro, iPad or other electronics, but also how long I have to wait for it to be fully charged and ready to go. This is part of the reason why I prefer solar power banks to normal chargers. While the solar charging usually takes longer than if it was plugged into a socket, it provides an extra top up while you’re out and about. This is going to be an essential factor for minimalist packers. You don’t want to be carrying around something huge that will take up space for other things from your bag. Smaller power banks usually have less charging capacity though; you need to find the perfect balance. Who doesn’t love additional features? While the main characteristic for a power bank is obviously the need for it to charge things, if it comes with some useful extras, that’s always a brownie points in its favour. 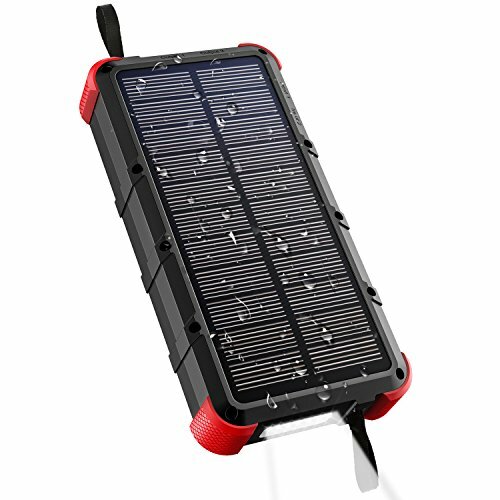 The OUTXE Solar Charger is a solar power bank designed for active outdoors people. It has a powerful charging capacity, efficient solar panels, and is waterproof and rugged to resist any shocks during your outdoor activities. Charging capacity: The OUTXE Solar Charger has a 20,000mAh capacity (I’m not a techy person but I’ve been told that’s a lot)! It can charge an iPhone to 100% around 7 times, sometimes more depending on how charged it was when you plugged it in. It has dual input so that you can charge more than one device at a time. How long does it take to charge? If you charge it with the cable and plug it into a power socket it will fully charge in 6 hours. It’s ideal as you can plug it to charge at night and it will be ready to go in the morning. Reaching a full charge on solar panels alone would take 40+ hours though, depending on the solar conditions. The panels are built for high conversion efficiency, however it is still easier and quicker to charge it from a power socket. For me the solar panels are a source of additional energy top up while being out and about more than the main charging source. Weight & size: The OUTXE Solar Charger is 15cm x 8cm x 2cm and weighs 520g. It’s slightly bigger than an iPhone and somewhat heavier. However for the kind of power and charging capacity it provides it’s still considered lights. I hate carrying around heavy things but it’s well worth the extra weight for the charging power it has. Additional features: The OUTXE Solar Charger is waterproof, dustproof and shock resistant. It’s built to be used outdoors, so that if you get caught in a rainstorm while hiking or drop it at the beach, it shouldn’t be affected. It also has a LED flashlight with three different light modes that can be used if you’re camping overnight. Overall the OUTXE Solar Charger meets all of my solar power banks criteria. It’s a bit heavy but the charging capacity it provides is worth the extra weight, especially if you attach it to the outside of your bag so that it can recharge while you’re out and about without taking up space in your backpack. It also doesn’t take too long to charge when you plug to a power source and has some nice additional features like the flashlight. As you may have realised by now, I’m pretty happy with my OUTXE Solar Charger. However to help you also make an informed decision about the best solar power bank and solar chargers for backpacking, I’ve put together a table that compares it to some other popular solar chargers out there. If you have recommendations for other solar power banks let me know, I’d love to hear your advice! I hope you’ve found this review of the OUTXE Solar Charger useful in helping you decide what solar power bank you should purchase. I’m personally very happy with my OUTXE solar charger and can highly recommend it. If you’re looking for a powerful solar power bank that can keep you going for a while, doesn’t require too long to charge and isn’t massive, this is the one for you. Enjoyed reading about the best solar power banks? Pin it! Thank you for this review! I was thinking to get an Anker solar power bank but looks like OUTXE Solar Charger would be a better choice. The article is awesome and very useful and it’s provide excellent information about Solar Power Bank .